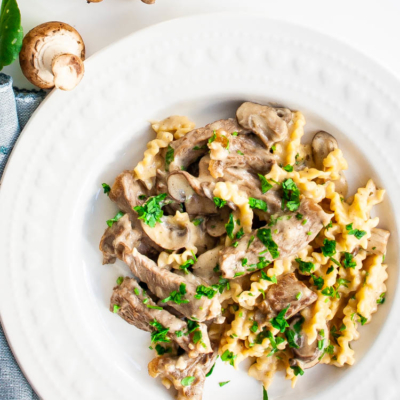 This rich and creamy Beef Stroganoff can be ready in only 30 minutes and it’s perfect for a busy night! 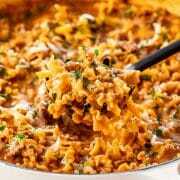 Delicious, juicy beef strips smothered in a creamy sour cream gravy cooked together with pasta all in one pot! 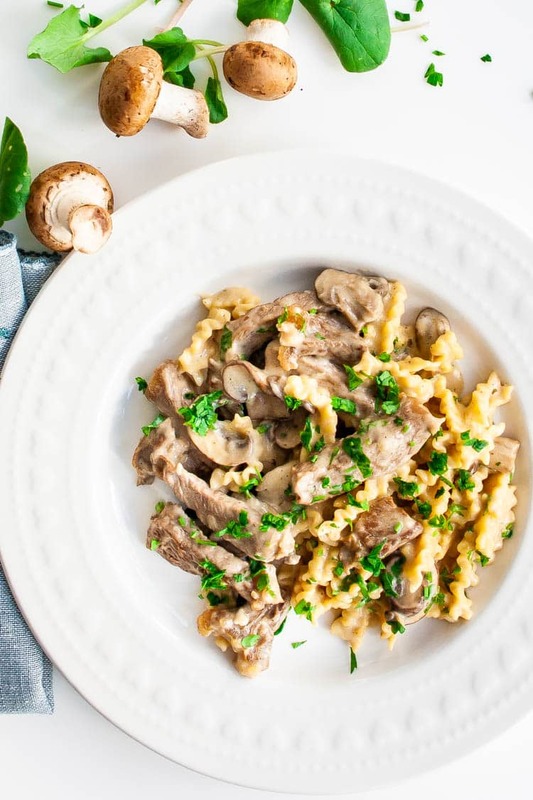 Beef Stroganoff is like the ultimate comfort food, especially when it’s all made in one pot, noodles and all. I’m talking tender strips of beef and mushrooms sautéed to perfection, then tossed together in a delicious sour cream gravy. Oh and the noodles, the noodles are cooked in that same pot and all in only 30 minutes! I’ve been baking Beef Stroganoff for as long as I can remember and everyone loves it when I make it. It’s gone in seconds! It’s absolutely mouthwatering and guaranteed to become your family’s favorite dinner! Beef Stroganoff or Beef Stroganov is a dish of Russian origin with sautéed pieces of beef served in a sauce with sour cream. 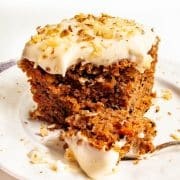 From its origins in mid-19th-century Russia, it has become popular around the world, with considerable variation from the original recipe. However, beef stroganoff has suffered from a severe identity crisis in the latter half of the 20th century. 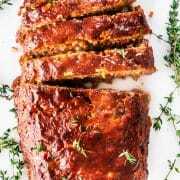 It now varies significantly not only based on geography and other factors, such as the cut of meat and seasonings selected. Meat for the dish can be cut in different ways and is sometimes diced, cubed, or cut into strips. 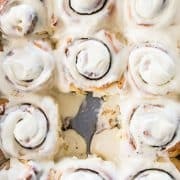 Some variations include mushrooms and onions or other vegetables and varied seasonings such as sugar, salt, black pepper, and bottled marinades and rubs. Rib eye steak – or rump or round steak. Butter unsalted – I usually always use unsalted butter in all my cooking and baking, this way I can control the amount of salt in my dishes. Garlic – the more garlic the better and fresh is always best. Don’t buy the jar stuff, it doesn’t taste the same. Cremini mushrooms – or any white mushrooms will work as well. All-purpose flour – this is used to thicken the sauce. Dry white wine – don’t skip the wine, it really does add great flavor. If you’re looking for a non-alcoholic alternative, use chicken broth instead. 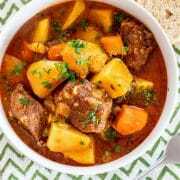 Beef broth – always use low sodium. 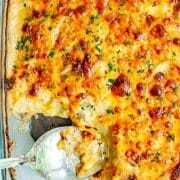 Sour cream – this provides great creaminess to the gravy. 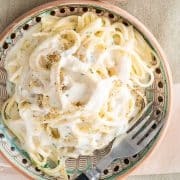 Pasta of your choice – I used a mafalda pasta, but traditionally this is served over egg noodles. The classic beef cut for beef stroganoff is a rump or round steak. However, I don’t find these cuts of beef as tender as a good rib eye steak. 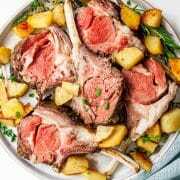 A rib eye steak could be quite expensive, so if looking for less expensive alternative, try a slow cooked version made with chuck or stewing steak. 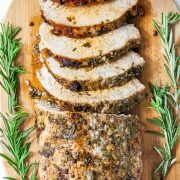 Here are some other suggestions; tenderloin, strip steak along with more inexpensive cuts like flap meat, hanger, flank and skirt. 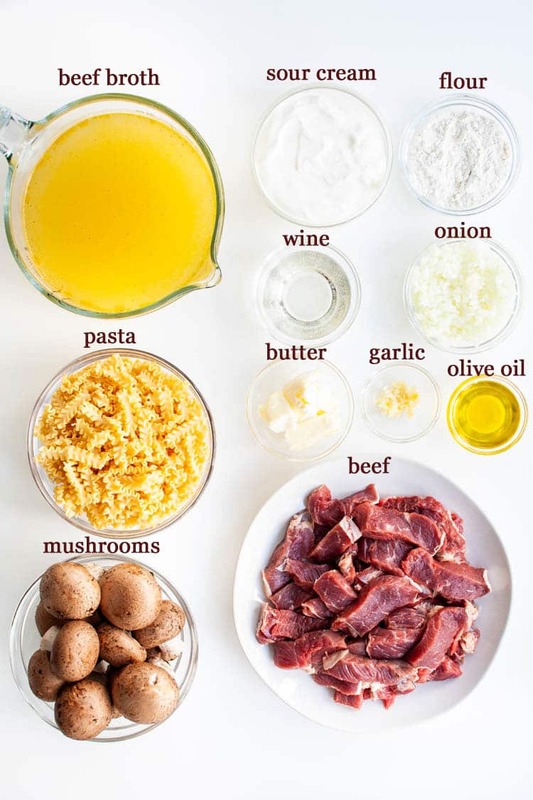 Making beef stroganoff ahead of time is a smart strategy, not just for entertaining, but for busy weeknight meals. 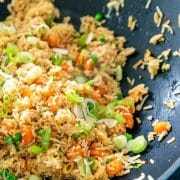 By making all or at least a portion of the dish a day or so beforehand, you’ll cut down not only on cooking time, but on clean-up time, as well. Toss a salad, heat up some crusty bread and your dinner is ready. 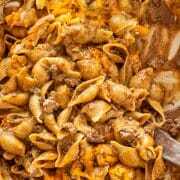 Savory foods, such as beef stroganoff, often taste even better the second day because the flavors have had time to meld. One thing to remember though, is the the noodles will soak up some, if not most of the sauce during storage. Heat oil in a large skillet over high heat. Scatter half the beef in the skillet, quickly spread it with tongs. Leave untouched for 30 seconds until browned. Turn beef quickly (as best you can!). Leave untouched for 30 seconds to brown. Immediately remove onto a plate. Don’t worry about pink bits and that it will be raw inside. Add remaining oil and repeat with remaining beef. This really is the secret to tender beef. Do. Not. Over. Cook. It. In the same skillet melt the butter. When the butter has melted, add the onion and garlic, season with salt and pepper. Cook stirring occasionally, until softened, about 4 to 5 minutes. Add the mushrooms and cook until they start to brown. Scrape bottom of fry pan to get all the golden bits off. This is where all the flavour is! Sprinkle the flour over the mushrooms and stir. Cook, stirring occasionally, until the raw flavor has cooked off, about 1 to 2 minutes. Stir in the wine and cook for 1 minute. Add the beef broth and sour cream and stir until incorporated. Don’t worry if it looks split, sour cream will “melt” as it heats. Add the noodles and stir to combine. Reduce the heat to medium low and simmer, stirring occasionally, until the noodles are just cooked through, about 6 to 8 minutes. Add the beef back in including plate juices. Simmer for 1 minute and then remove from stove immediately. This beef stroganoff already comes with noodles! There you have it — the perfect dish for an easy weeknight dinner! I honestly see beef stroganoff as a stand-alone dish. 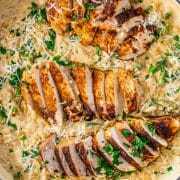 It’s traditionally served with pasta; however, it is just as good with rice or mashed potatoes. If you are looking for a side I would recommend steamed broccoli or roasted carrots. If you want to keep it simple, I would suggest a salad with cherry tomatoes, some croutons and parmesan shaving, dressed with a drizzle of balsamic vinegar. 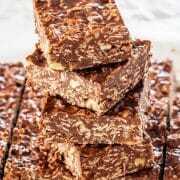 Once cooked, cover the dish and refrigerate it immediately, or within two hours, in the fridge. 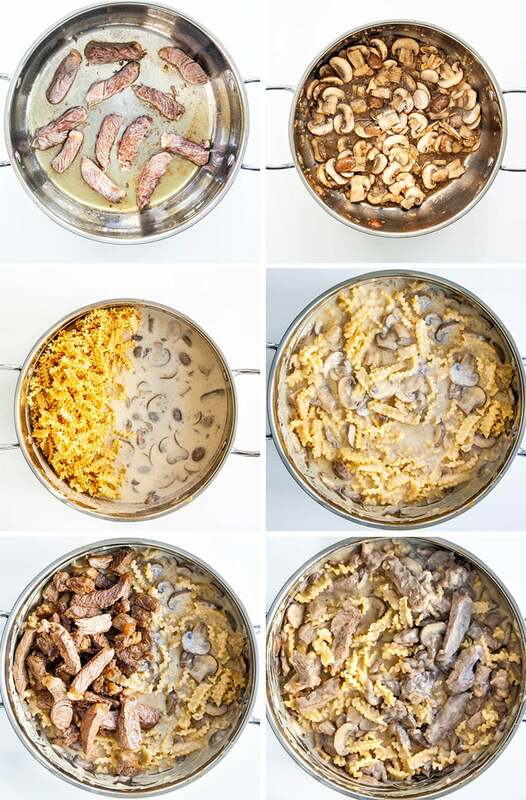 Prepared and refrigerated this way, you can safely store beef stroganoff for up to 3 to 4 days. The remainder should be packed in airtight bags or containers and frozen for later use. Yes, it freezes very well. Sometimes the sauce will develop a yellow tinge when frozen, but it turns creamy white again when heated. 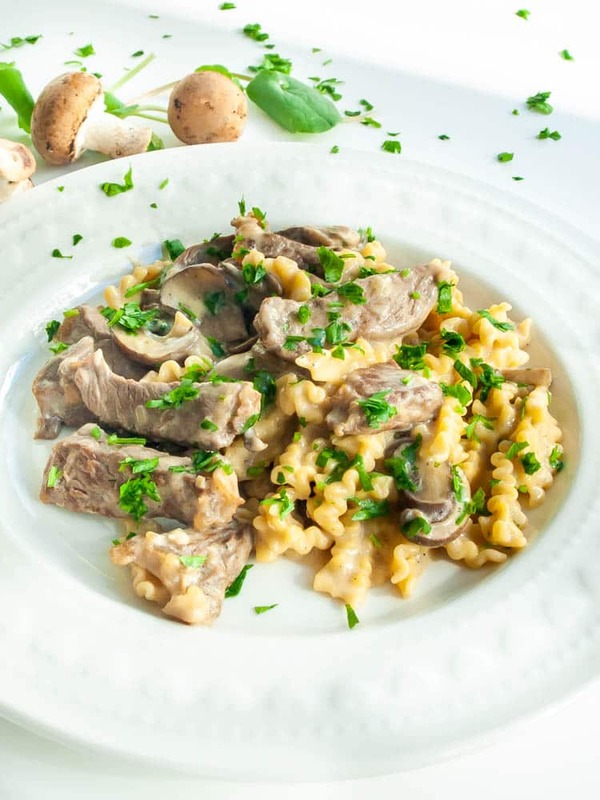 Beef stroganoff is an ideal dish to freeze. Put into an airtight container or large snap-lock bag. Freeze for up to 3 months. 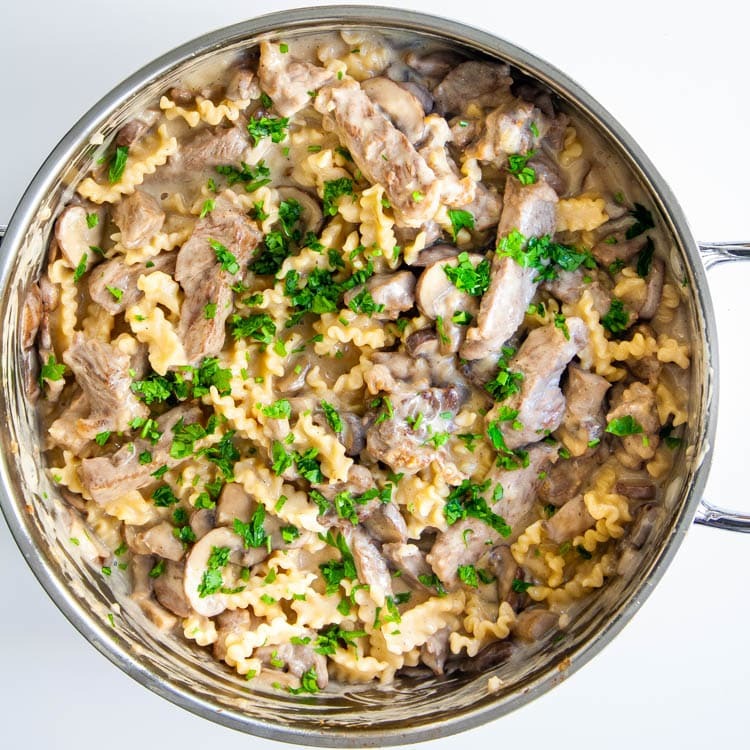 This rich and creamy Beef Stroganoff can be ready in only 30 minutes and it's perfect for a busy night! Delicious, juicy beef strips smothered in a creamy sour cream gravy cooked together with pasta all in one pot! Sear Beef: Heat 1 tbsp oil in a large skillet over high heat. Scatter half the beef in the skillet, quickly spread it with tongs. Leave untouched for 30 seconds until browned. Turn beef quickly (as best you can!). Leave untouched for 30 seconds to brown. Immediately remove onto a plate. Don't worry about pink bits and that it will be raw inside. Add remaining 1 tbsp oil and repeat with remaining beef. Cook onion and garlic: Turn the heat down to a medium-high. Add the butter and melt. 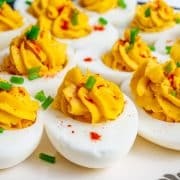 When the butter has melted, add the onion and garlic, season with salt and pepper, and cook, stirring occasionally, until softened, about 4 to 5 minutes. Cook mushrooms: Add the mushrooms and cook until they start to brown. Scrape bottom of fry pan to get all the golden bits off (this is flavour!). Add in flour: Sprinkle the flour over the mushrooms and stir. Cook, stirring occasionally, until the raw flavor has cooked off, about 1 to 2 minutes. Add wine, wine, broth and sour cream: Stir in the wine and cook for 1 minute. Add the broth, sour cream and stir until incorporated. Don't worry if it looks split, sour cream will "melt" as it heats. Add noodles and cook: Add the noodles and stir to combine. Reduce the heat to medium low and simmer, stirring occasionally, until the noodles are just cooked through, about 6 to 8 minutes. Return beef: Add beef back in including all the juices left in the plate. Simmer for 1 minute, then remove from stove immediately.